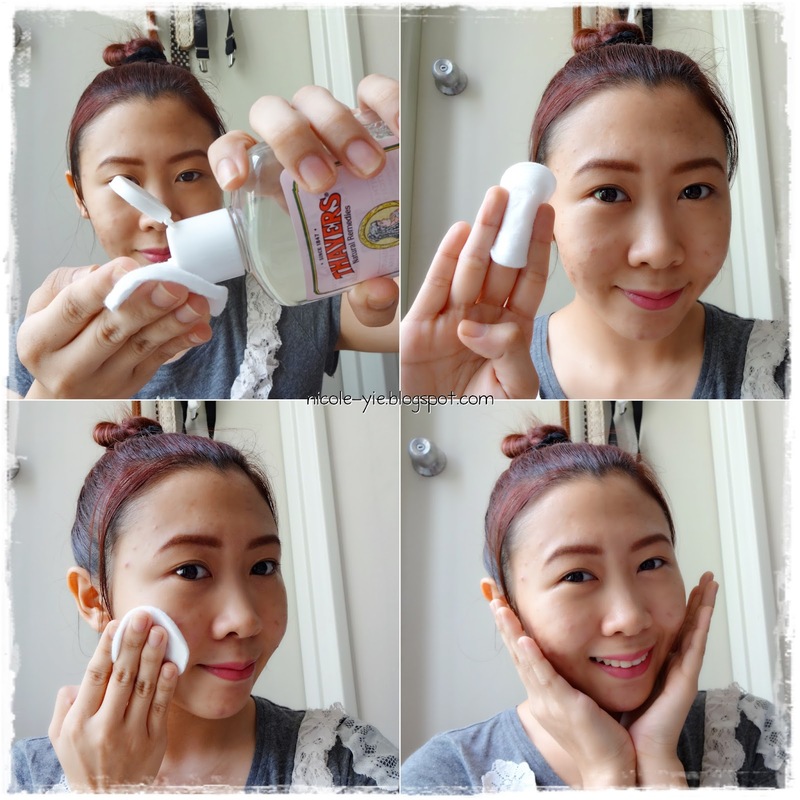 I've heard lotsa people saying that using toner that contains alcohol will dries up your skin. Yup, you heard it right, some toner contains alcohol if you don't know yet. Toner with alcohol not just tend to make your skin dry, it also slows down your skin repairing process especially for acne-prone skin person like me. I used to hurt my skin after putting too much alcohol based toner on my skin, and it looks exactly like sun burn. Last month, Natta Cosme has sent me the Thayers Alcohol-Free Toner in Rose-petal scent for review purpose. I'm glad that it came in time as I'm out of toner to use at the moment. As always, a love letter from team Natta Cosme whenever they sent me product for review. Thayers is a beauty care veteran from America since 1847. It's known as America's oldest toner. Thayers has a range of healthy natural ingredients featured Toner. Rather peculiar is that this company do not produce other skin care products, such as facial cleanser, cream and the like, only to 5 Features Toner conquer the world, we can see this has through 120 years of test formulations. Personally love the simple transparent bottle very much! Thayers Rose Petal Alcohol-Free Witch Hazel with Aloe Vera Formula Toner will make your skin bloom. Its remarkably soothing toner is made with rose-petal water, Vitamin E and our proprietary Witch Hazel extract. As mentioned in my previous toner review, it's important to own a toner which is able to cleanse and moisturize your skin, and Thayers promises that they are able to do so. The toner which is almost feel like water makes toning so much easier! Apply with a cotton pad to cleanse, soften, refresh and moisturize skin. Use anytime throughout the day as a softening refresher. Remember to swipe it in an upward motion as our pores are facing downwards. Sometimes I poured a small amount of Thayers toner onto my palm, and dap it directly onto my skin. Since it's very watery, I filled the toner into a small spray bottle and bring it along in my handbag so that I can keep my skin refreshing, toned and moisturized anytime anywhere! Convenient right? 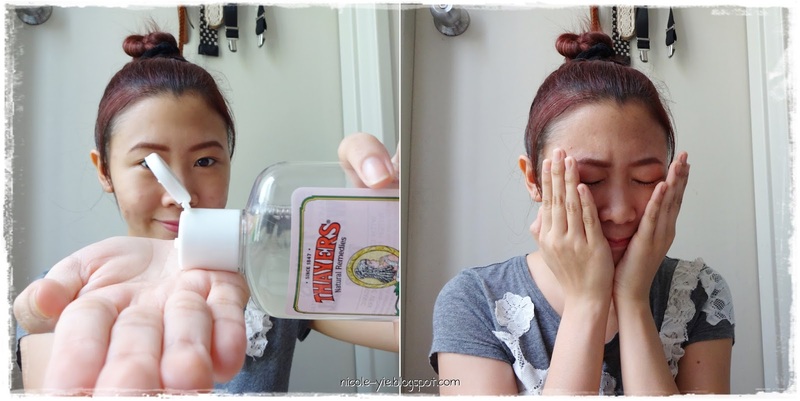 This huge bottle of toner can last at least half a year for me! As I'm wearing sunscreen and sometimes concealer almost everyday, toner is now a very important step in my daily skincare routine as a second cleansing step. It's important for me to pick the right toner without making my skin worse, and I have to say that Thayers has made a great toner! On my first few days using this toner with a cotton pad, there are some make up residues left on the cotton pad, such as my left over BB cream, sunscreen or eyeliner residue which did not properly cleansed away while cleansing my face with cleanser. As you can tell, it's a bit brownish after wiping my skin on the first week. Then the residues on the cotton pad reduced after a week later, and I have to say that it has almost nothing now! It did it's main job which is to cleanse away extra residues on my skin! Besides, it refreshes my skin so much every time I used it! My skin feels smooth and clean without feeling dry. I can feel that my skin is not that oily anymore as it helps to moisturize my skin. So here are some tips for you babes out there! Damp your cotton pads with Thayers Alcohol-Free Toner and apply the cotton pads onto your skin to use it as a moisturizing mask! Leave it for 10-15 minutes and you'll feel your skin so damn refreshing!